Ever had a chance to visit Garfield Minus Garfield? It's a site dedicated to removing Garfield from the Garfield comic strips in order to reveal the existential angst of a certain young Mr. Jon Arbuckle. It is a journey deep into the mind of an isolated young everyman as he fights a losing battle against loneliness and depression in a quiet American suburb. It really is amazing how the strip takes on a whole new meaning with Garfield out of the picture. Peanuts, with no alterations needed, could be very poignant and philosophical. Of course, no one waxes existential like my main man, Calvin. Then there's The Nietzsche Family Circus. 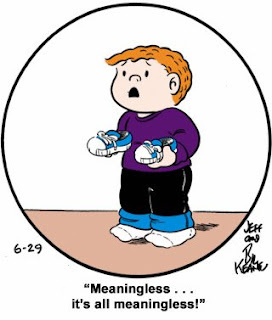 The site pairs a randomized Family Circus cartoon with a randomized Friedrich Nietzsche quote. For example this picture came up with the quote: You have evolved from worm to man, but much within you is still worm. Once you were apes, yet even now man is more of an ape than any of the apes. Not usually very funny, but read enough of them and you'll start laughing nihilistically. Commentary: Marmaduke is bi-curious. And not the least bit shy about it. 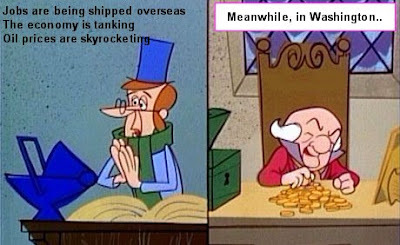 And speaking of cartoons, I made this little picture after watching the debate last night. I never knew I could learn philosophy from comic strips. That's pretty cool. I'll definitely have to check that all out. Cool and interesting post. Keith- As usual, thanks for the positive feedback. I'm weak with anticipation for your newest blog -"that ol' black magic". Saturday Morning TV #2: Those Meddling Kids! You can put lipstick on a pig? What?